They were chargesheeted for alleged offences punishable under section 120-B (criminal conspiracy) of IPC and under relevant provisions of the Prevention of Corruption Act. A special court in New Delhi discharged former Telecom Minister Dayanidhi Maran (above), his brother Kalanithi Maran and others in the Aircel-Maxis deal cases lodged by the Central Bureau of Investigation and the Enforcement Directorate (ED). However, Thursday’s (February 2) order would not have any effect on the two accused Malaysian nationals -- Ralph Marshall and T Ananda Krishnan -- as the court has already segregated the trial against them from that of Maran brothers and others. The order was passed by Special Judge O P Saini who is exclusively dealing with the 2G spectrum allocation scam cases and those cases arising out of the investigation into it. CBI had filed a charge sheet against the Maran brothers, Ralph Marshall, T Ananda Krishnan, M/s Sun Direct TV (P) Ltd, M/s Astro All Asia Networks Plc, UK, M/s Maxis Communications Berhad, Malaysia, M/s South Asia Entertainment Holdings Ltd, Malaysia and then additional secretary (telecom) J S Sarma who died during the course of the probe. In the money laundering case, ED has chargesheeted the Maran brothers, Kalanithi's wife Kavery, Managing Director of South Asia FM Ltd (SAFL) K Shanmugam, SAFL and Sun Direct TV Pvt Ltd (SDTPL) under provisions of the Prevention of Money Laundering Act (PMLA). 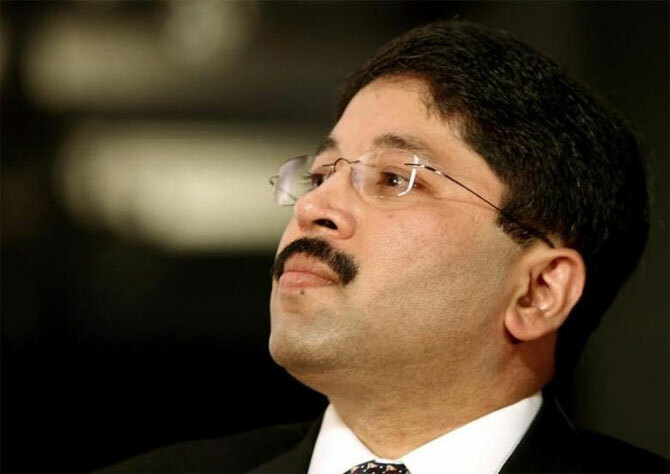 Besides the Maran brothers, the court discharged two companies - M/s Sun Direct TV (P) Ltd (SDTPL) and M/s South Asia Entertainment Holdings Ltd.
During arguments on framing of charges, Special Public Prosecutor Anand Grover had claimed that Dayanidhi had "pressurised" Chennai-based telecom promoter C Sivasankaran to sell his stakes in Aircel and two subsidiary firms to Malaysian firm Maxis Group in 2006. The charge was strongly refuted by Dayanidhi. All the accused had denied the allegations against them made by the investigating agencies and had moved bail pleas. In the money laundering case, ED had chargesheeted the Maran brothers, Kalanithi's wife Kavery, managing director of South Asia FM Ltd (SAFL) K Shanmugam, SAFL and Sun Direct TV Pvt Ltd (SDTPL) under provisions of the Prevention of Money Laundering Act (PMLA). The court had summoned the six accused after taking cognisance of the ED's charge sheet, saying there was "enough incriminating material" to proceed against them. While arguing on the issue of framing of charges against him, Dayanidhi had claimed that during the time period in which the alleged crime was committed, as claimed by CBI, Sivasankaran was in talks with several companies to sell his stakes in Aircel. It was only in October 2005 that the business transaction between Aircel and Maxis was finalised, his counsel had said. His brother Kalanithi had also argued that CBI's claim was false and the complainant was himself eager for the business and that he was being falsely implicated in the case. The court had on September 24, 2016 issued open warrants of arrest against Krishnan and Marshall on CBI's plea stating that summons issued to them could not be served. During the arguments earlier, ED's special prosecutor N K Matta had claimed that there were money transactions which allegedly showed that SDTPL and SAFL had received Rs 742.58 crore as "proceeds of crime" from Mauritius-based firms in the Aircel-Maxis deal. The agency had claimed that "proceeds of crime" amounting to Rs 549.03 crore and Rs 193.55 crore were received by SDTPL and SAFL, allegedly controlled by co-accused Kalanithi, through various Mauritius-based entities. ED had earlier alleged before the court that Dayanidhi had generated funds worth Rs 742.58 crore through illegal means and there was sufficient prima facie material to proceed against him and other accused in the case. It had then alleged that Dayanidhi had obtained "illegal gratification" of Rs 742.58 crore and the money was "parked" in the firms of Kalanithi by projecting it as untainted. ED had also claimed that Kalanithi was controlling both SDTPL and SAFL, where the money was infused through Mauritius-based companies.